There are few sporting events that can compete with a Cricket test match for extended betting opportunities, both ante-post and in-play. 2013 sees England faced with a number of competitive matches throughout the sunnier summer months – against our Antipodes rivals New Zealand in May and Australia in July – giving you plenty of chances to test your cricket betting skills in the run-up to the second of the back-to-back Ashes series in November. Why Bet on the Tests? Test cricket can be profitable for a savvy sports bettor, not only because there's a wide range of markets to choose from, but also because you have plenty of time to reverse your position from a losing one to a winning one. With loads of player and team statistics readily available online, all you need is a little forward thinking, or, thanks to the numerous in-play markets now available, some shrewd betting in response to what you see going on during a match. Played at an international level, test cricket comprises of four innings. With no set number of overs in tests - only the five-day limit on play - you'll find a wide variety of betting options. A comprehensive betting site like Betfair Sports gives you day-to-day markets such as total runs, batting partnerships, and potential wicket hauls, and the length of the match gives you time to adjust or lay your bets. What most people bet on, though, is the match result. A test can be decided in a number of ways (by runs, by innings, by wickets), so in this market you’re essentially betting on whether a team will be able to out-bat or out-bowl their opponents, or whether the game will finish as a draw. Match odds can change wildly as momentum swings from one side to another, meaning that if you're quick to take advantage of changes in the in-play markets you can secure yourself some very good prices - and if you're lucky enough to be in the ground itself, many sports bookmakers now offer mobile apps that allow you to bet in-play on your smartphone. Tests require a substantial amount of research to make sure you’re getting the right odds. Firstly, the ground can significantly affect a team’s chances. For example, India are notoriously difficult to beat on their home turf, even with a weak team – in 2012, England won their first test series there in nearly 30 years. Players’ individual quirks should also change the way you bet. For instance, Kevin Pietersen, considered by some to be England’s greatest modern batsman, is vulnerable to left-arm spin bowlers. Use such knowledge in-play and you can, for example, lay your bet (or ‘cash out’) for any wagers involving Pietersen when such a bowler comes into play. Changes in the weather, affecting game time, are important when betting on a runs market, as a shortened game can cause a captain to declare in order to try to bowl the other team out. The odds can often shift as dramatically as the weather itself, and if you’re quick to act (before official announcements are made) you can take advantage of this. If you bet on the total number of runs made in a day, potential rain could be as important as a team’s strengths. If you base your bets on good instincts regarding the weather, you might be able to make a seemingly unlikely bet pay off. Betting on test cricket requires patience, detailed research and attention to the game in-play, but given the length of the matches you should be able to get a good grasp of successful cricket betting strategies. 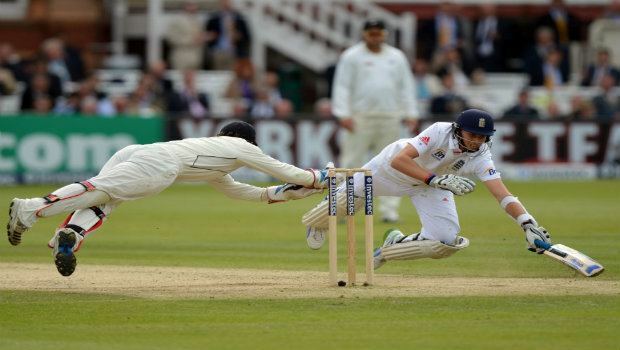 To bet on test matches, visit Betfair Sports today for both ante-post and in-running options.